What can one do with cardboard leftovers? Apparently, many things. These cardboard boxes that surround our consumer life, has turned in the hands of one determined mother, into magical play spaces, that are now for sale. 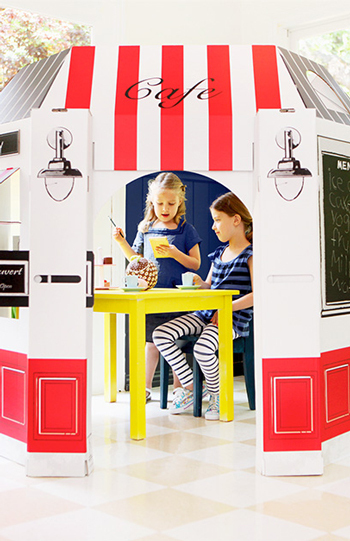 Mom-turned-designer Kate Fagelman of Little Play Spaces has created a series of kid-sized recycled cardboard playhouses that are so cool we wish she made them for us ‘big-kids’. The French Cafe has a chalk board menu, shelves for the finest little cheeses, menus and more. Fagelman also offers a Medieval Castle complete with a tower and a customizable family crest for the little knights and princesses of your home. The Medieval Castle is a fabulous play space for little knights and young warriors alike. This sturdy four-sided structure is designed to withstand attack and is the ideal space to hold a prisoner at bay or hide away from opponents. From the front, two armored knights stand guard of the main gate and, look closely, and you'll see their visors are actually slits for spying on those approaching fast. These two amazing examples of recycling cardboard are now for sale at Fagelman’s website for $79.